DITMARS — Australian-inspired Queens eatery The Thirsty Koala just added a little bounce to its burgers. The Astoria restaurant, which opened in December at 35-12 Ditmars Blvd., started serving kangaroo burgers, sliders and steaks last month — and the marsupial meat is so popular chef and co-owner Katherine Fuchs said she sells more of it than regular beef. "I think it's popular because people are craving different experiences with food," she said, adding the food scene is trending towards novelty meats. "There's a lot of other meat out there. People are eating elk, they’re eating emu, they’re eating ostrich," she said. "So why not kangaroo?" 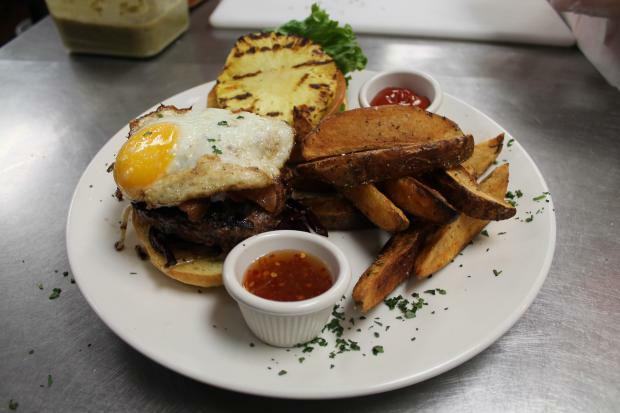 Kangaroo meat is on the menu at an Astoria eatery. The new 'roo offerings include a $15 8-ounce burger with "the lot" — Australian slang for all-the-fixings — that comes topped with bacon, beet root slaw, grilled pineapple, caramelized onions, house-made goat cheese and a fried egg, all squeezed into a brioche bun. The kangaroo sliders are served with a cucumber pineapple salsa, sautéed shallots and a chipotle sauce. The kangaroo filet — a cut of meat that's a cross between a strip steak and a tenderloin — comes with a side of kumara mash, a type of yam that’s grown in New Zealand. They order the kangaroo meat from a ranch in Queensland, Australia, by way of the Hunts Point Market in the Bronx. The Thirsty Koala also uses lamb sourced from Australia for its herb-crusted double lamb lollies, and the menu also incorporates a number of Oz-based herbs and spices that co-owner Christine Chellos — a Sydney native — brought back from a recent trip home. The restaurant is a labor of love for Fuchs, Chellos and another co-owner, Alex Styponias — longtime friends and Astoria residents. Styponias said his first kangaroo-eating experience was his own restaurant's dishes. He said he "got hooked" on the meat after trying the burger last month. "It's really, really yummy," he said. "I would say it tastes like a filet mignon. It's really sweet and tender, and it's not as gamey as one would think."